What to do when your town has been walloped by a ferocious late-winter storm and it doesn’t make sense to leave the house? When all the cold and blowing snow threaten to bring your spirits down? You make Welsh cakes, of course. They fill the house with a lovely smell, you get to practise your photography, and finally you get to eat them, preferably with a pot of tea. Most people I know have never heard of Welsh cakes, but I remember a time when they were sold in packages of six or so at the supermarket. You can’t find them anywhere these days, but they’re easy to make. 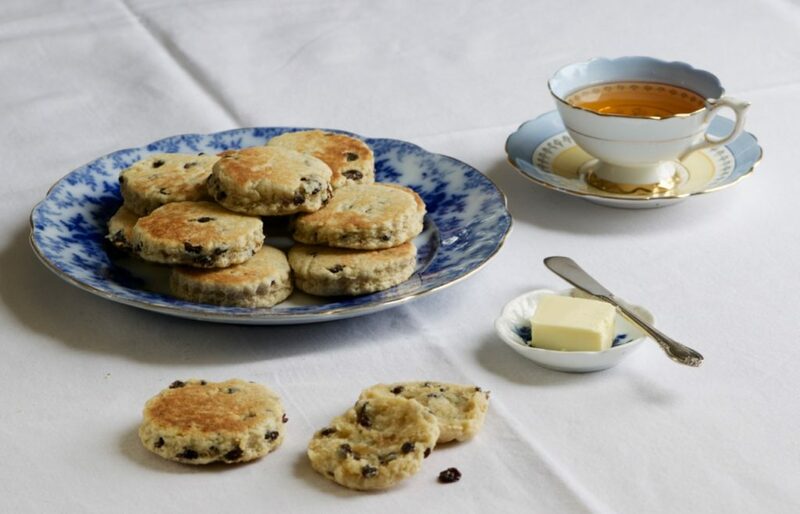 Traditional to Wales, they’re a cross between a thin biscuit and a crumpet, sweet, studded with currants, and aromatic of cinnamon, nutmeg and allspice (known as “mixed spice” in the UK). Once rolled and cut out, they’re cooked on a griddle, dry or lightly oiled, until they turn golden brown, crisp on the outside, tender and crumbly on the inside. This recipe comes to us from the UK celebrity chef Paul Hollywood, best known as the judge, along with Mary Berry, on the popular Great British Bake Off, which airs in these parts on PBS. It’s such a civilized cooking show, a pleasure to watch; there are tears and terrible disappointments, but the pace seems slower than on North American cooking competitions, the atmosphere friendlier, the judges more kindly. And it all takes place under a huge tent in the middle of a green field in the English countryside – not in some dark, windowless studio. But I digress. I found this recipe in Hollywood’s British Baking cookbook, along with other quaint and homey recipes for things like Shrewsbury Biscuits (butter cookies) and St. Fillans’ Pudding, an apple raspberry cobbler. You will need a weigh scale, but you should have one anyway because it allows for more accurate baking. The recipe calls for sprinkling the Welsh cakes with sugar once they’re out of the oven but I found them sweet enough already and skipped this step. Up to you. Do whatever you need to do to stay cheerful. Sift the flour, baking powder and allspice into a bowl. Add the butter and rub it in with your fingers until the mixture resembles fine breadcrumbs. Stir in the sugar and currants, mix in the egg, then add enough milk to form a firm dough. 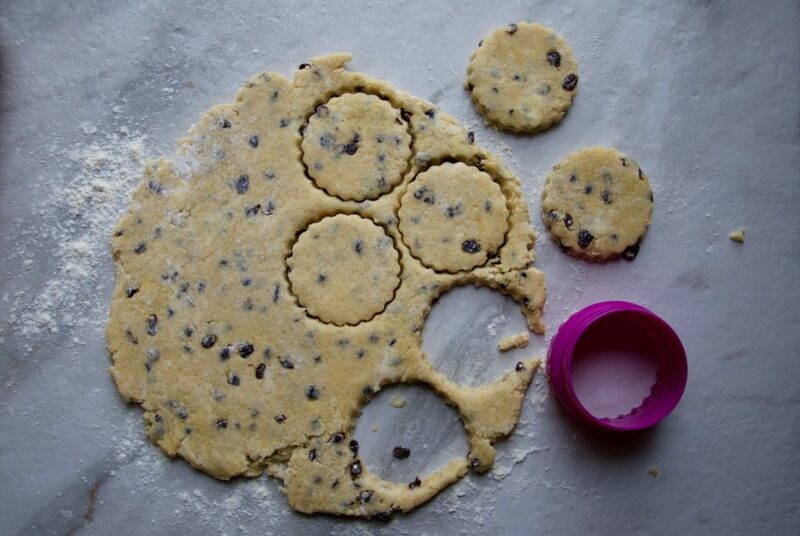 On a lightly floured surface, roll out the scone dough to a 5 mm thickness. Stamp our rounds using a 7.5cm fluted cutter, re-rolling the trimmings to cut more as necessary. Place a flat griddle or a large heavy-based frying pan over a low-medium heat. When it is hot, grease it with a little butter or oil (this step is not necessary, the cakes will not stick in a dry pan). 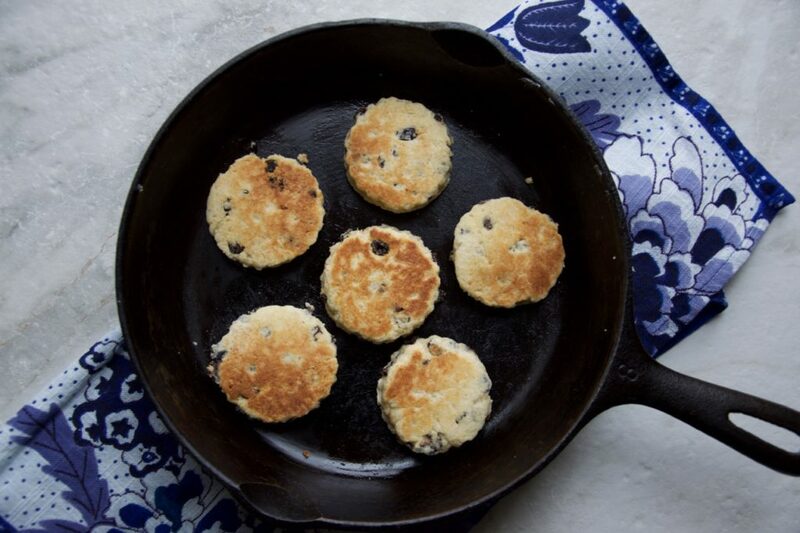 Cook the Welsh cakes, in batches, for 3-4 minutes on each side, adjusting the heat if necessary so they are golden brown on the outside and cooked right through. Remove the Welsh cakes from the griddle and sprinkle with caster sugar (this step is optional). They are best served immediately – though any left over will also be good cold, or heated gently in a toaster or under the grill the next day. Are you ready to rumble Rhubarb Crumble? No Replies to "Wales takes the cake"